For generations, traditional healers in Southeast Asia have used the mangosteen fruit to treat skin infections, wounds, dysentery and urinary tract infections. A new $1.7 million grant from the National Cancer Institute will enable researchers at the University of Illinois at Chicago to study the fruit and its potential as a treatment for prostate cancer. Led by Dr. Jeremy Johnson, associate professor of pharmacy practice at the UIC College of Pharmacy, the researchers will expand on prior work, which identified phytochemicals in the fruit that can disrupt the function of the androgen receptor, a critical target in prostate cancer. In past studies, Johnson’s group reported that mice treated with their mangosteen extract had prostate tumors that were 88 percent smaller than tumors in a control group. Over the course of five years, the new funding will enable researchers to study how specific xanthones in mangosteen inhibit androgen receptor activity in prostate cancer cells. 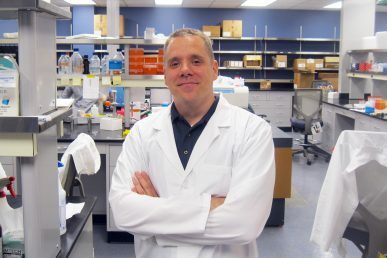 Johnson, who has also worked as a pharmacist, and his team will study how orally administered mangosteen xanthones are absorbed in animal models; they later will conduct experiments to determine what dose of the mangosteen xanthones are most effective at preventing or treating prostate cancer, also in animal models. Round with a deep purple outer layer that surrounds the white pulp fruit, mangosteen is cultivated primarily in Thailand and other Southeast Asian and Pacific Rim countries. 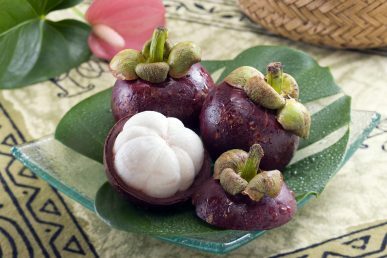 A long history and folklore surround mangosteen, also referred to as the “Queen’s fruit,” for its unique flavor and medicinal benefits. Queen Victoria, who lived from 1819 to 1901, is said to have offered a cash award to anyone who could bring mangosteen back to England. Many in the U.S. may not be familiar with the mangosteen fruit, Johnson said. It was not approved for import into the country until 2007 but he says it may be found in local Asian grocery stores or Chinatown. Along with his research on mangosteen, Johnson and his laboratory are studying Mediterranean herbs – including rosemary – for inflammatory bowel disease and colitis. Co-principal investigators on the grant, which was awarded by the NCI’s National Cancer Advisory Board as a MERIT Award, are Maarten Bosland, professor of pathology in the UIC College of Medicine, and Chun-Tao Che, the Harry H.S. Fong Professor of Pharmacognosy.